The Public Diplomacy Council has taken on some outstanding new members over the last few months. As the national organization dedicated to the advancement of the public diplomacy profession, we believe that effective public diplomacy is indispensable to successful national security. For that reason, the Council promotes improved professional practice, academic study of the field, and responsible advocacy on behalf of public diplomacy. The Council’s strength is in members who represent a rich cross-section of the individuals, associations, and organizations engaged in and knowledgeable about public diplomacy. Here are some of our newest members. Marcia Bosshardt, who co-leads our “Lunch and Learn” programs and remains an active practitioner of public diplomacy after a career in public diplomacy as a United States Foreign Service Officer. Roger-Mark de Souza, the President and CEO of Sister Cities International. Barbara Keller, an inspector with the U.S. Department of State Office of Inspector General and an independent anti-money laundering (AML) compliance consultant. 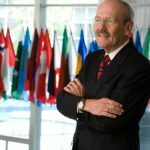 Dr. John Scott Lucas, who leads ISEP International Student Exchange Programs, a community of 330 colleges and universities around the world. Julie Moyes, who instructed Foreign Service Officers in cultural affairs tradecraft, and whose U.S. Foreign Service career included Principal Officer/Consul General in Edinburgh and Acting Deputy Chief of Mission and Charge d’Affaires in The Hague. Syracuse University after a career in public diplomacy as a Foreign Service Officer. Dr. Michael J. Schoenfeld, Vice President for Public Affairs and Government Relations at Duke University. Dr. Giles Scott-Smith, Associate Professor, Institute for History, Leiden University. Kathleen Sheehan, Executive Director, Council of American Ambassadors. The Council is now actively seeking members, both full and associate, whether in the Washington area or elsewhere. To learn more about these newest members, or about the nomination process, go to our Membership page.